Maggie has fallen in love …. I have spent 6 days in a tiny corner of Newfoundland & Labrador and have just fallen in love with the place. It is my 3rd visit to Canada and I like it more each time I go. 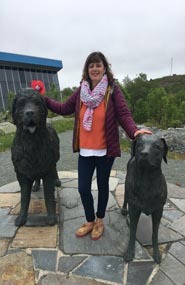 I spent 4 nights in St. Johns then 1 night and two days away from the City staying in Port Rexton visiting delightful little towns and ports on our whistle stop taster of the region. Newfoundland is not a place to go if you want guaranteed sunshine, want to laze by a pool and order a cocktail. 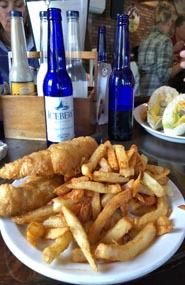 If you enjoy amazing scenery, fabulous food, and fish literally from the boat via the pan onto your plate, walking in peace and quiet while watching whales in the bay. 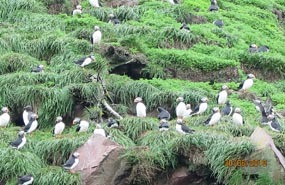 Sit on a rock and watch Puffins fly to their nests, look at Bald Eagles waiting to dive and catch Caplin landing on the beach on their yearly trip back to spawn. This area is known as Iceberg Alley and they come straight into the bays, there is even a gentleman who harvests the Icebergs so you can buy Iceberg Beer, Gin & Vodka all very tasty! 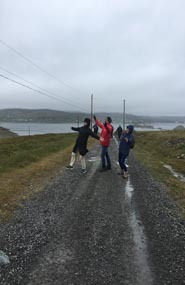 The one constant in Labrador & Newfoundland is the weather constantly changes, we were in bright sunshine which then turned into fog which was then blown away by the not inconsiderable wind. So pack your walking boots, a hat & gloves, a quilted jacket with your waterproof but don’t forget your shorts and sun glasses too. St Johns has a real Irish feel to it and the accent in Newfoundland has a real Irish twang so I felt right at home here. Everywhere you go people play live music, our driver and guide Carl burst into song in The Rooms Museum with a guitar from a display, same when we went Whale watching the lads from Gatherall’s entertained us with singing and playing of various musical instruments in the pouring rain, even skipper Bob in from Ecotours in Trinity played the guitar beautifully to us while we were eating a delicious home-made lunch. 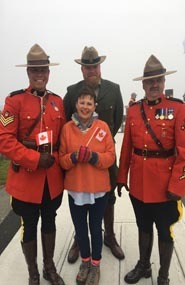 The people are very warm and friendly with a great sense of humour and great pride in Newfoundland, they want you to love it as much as they do which is quite refreshing. Only a 5.5hour flight from Heathrow into St Johns and less than 5hours coming home, I am sure it was 4.5hours. Just enough time to have a bit to eat and watch a movie, little snooze and you are landing! So a lot closer than you think. As is always the way on these trips we had lots of things scheduled to go and see mainly places of Interest and just a couple of hotel visits. Normally I write about the things I do and see but that would not do Newfoundland justice so I shall show some pictures that will indicate some of what we saw and did including the ever changing weather! Canada Day 01 July at 0700 hrs in the morning as this is the first place in Canada to start celebrating, great to be there on this special day. Cape Spear Lighthouse National Historic Sight www.pc.gc.ca Cape Spear is Newfoundland’s oldest surviving lighthouse. The light mechanism in use in the 19th Century came from Inchkeith Lighthouse in Scotland. 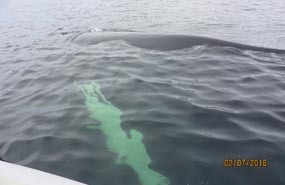 It’s a great place for Whale watching during their season. This is as Far East as you can get on the continent. Straight across the Atlantic lies County Clare in Ireland, so I waved to my friend Anne Marie who lives there, not sure if she saw me though!!! Puffins nesting as seen on our Gatherall’s Puffin & Whale Tour, this was a wet and windy morning and unfortunately we didn’t spot any whales but saw hundreds of Puffins which are the funniest looking birds as they fly past you at breakneck speed before sometimes running out of steam an flopping into the water. 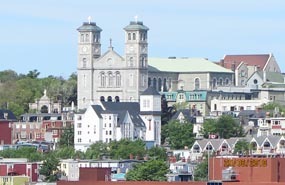 The pretty city of St John’s, lots of fab places to eat, I did see a some shops but didn’t really have the time to look for too many, great nightlife with live music. 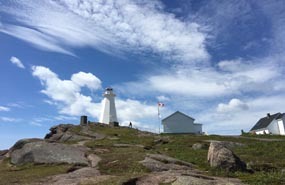 A great base for a 3-5 night break as not far to go out for the day, for example Cape Spear is only 17Kms away. Two great museums, The Rooms and Johnson GEO Centre, which was quite scientific with a great Titanic display to wander through,and most interesting. 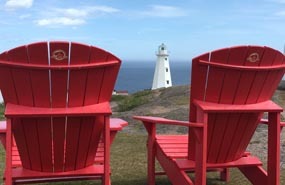 Other places to visit while here Signal Hill National Historic Site, Quidi Vidi Village and Plantation including the Brewery that makes the Iceberg Beer. 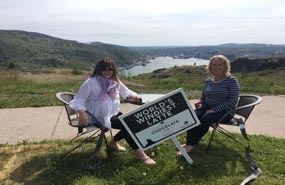 We did one of our Whale watching from here and the Ferryland Lighthouse lunch so your days are soon filled if you want them to be. While travelling away from the City we visited so many interesting places one of the most interesting was the John C Crosbie Sealers Interpretation Centre with an amazing sculpture of a Father and Son who died on the ice, very sad! 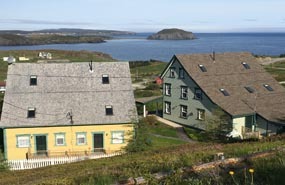 This is where we spent our night when out of the City, an award winning top rated rural Inn Fishers Loft Inn at Port Rexton. A fabulous family run hotel that has grown over the years into several different buildings. They even have a Convention centre on the hill where they have art exhibit’s. They grow a lot of their own produce and we had yet another amazing dinner, you have to pre book and it is licensed dining by reservation. I was very fortunate and had room 12 which was the top floor of the green building which was a suite so was the whole floor. I saw a whale swimming in the bay when I went out for an early morning walk, it is so peaceful here. It is recognized in National Geographic Travellers stay list as one of the 15 best places to stay in Canada. As with the rest of this region great walking trails to explore. This is a region I am sure I will return to and have time to actually go on some of the walks….